Prawn Souvlaki with Ladolemono-dressing, one of the best prawn-recipes! ‘I think souvlaki is a way of preparation (for some people it’s a lifestyle, they only eat souvlaki). You can have meat souvlaki, fish souvlaki or even vegetable souvlaki. The idea is that you make a combination of the things you like, skewer them on a stick and grill them to perfection. 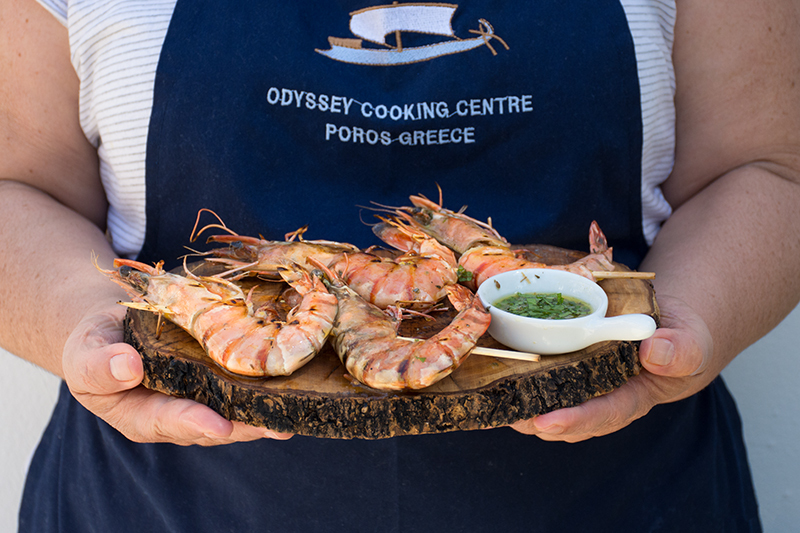 Out of all the different types of souvlaki that we make in Greece and all the combinations we make with things on a skewer, the ones with the prawns are the nicest, the juiciest, the tastiest and the loveliest, if they are made well of course! The summer breeze that transports the smell of the sea to Odyssey and the colour of the prawn souvlaki, remind me of the beautiful summer sunsets. Prawn souvlaki is not just food to fill our bellies, it’s like a poem to our senses! 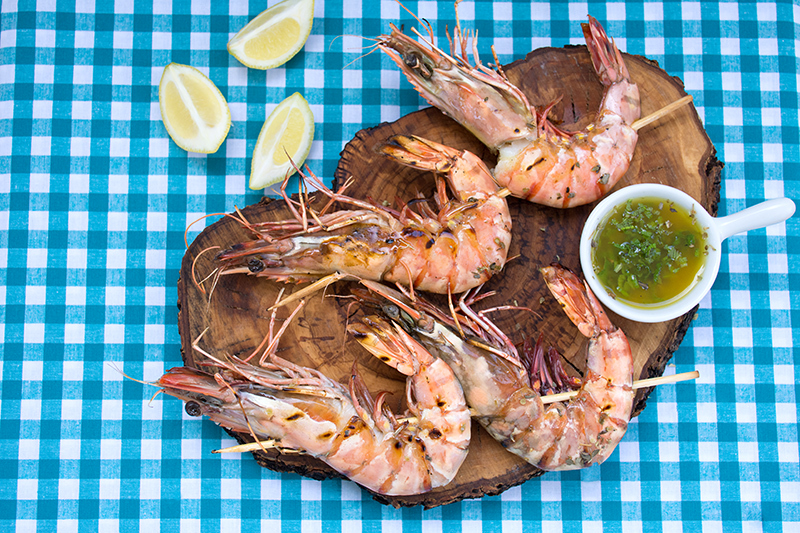 When the prawns are coming off the grill and you squeeze a few lemon juice drops on them, you think you are no longer on earth but in heaven. I don’t think that people one day woke up and said ‘Let’s make a prawn souvlaki.’ I think that such a job took hundreds of years to be perfected and presented to us in its current state. So, Ladies and Gentlemen, today I present you the one and only most fantastic way of preparing prawns: Prawn Souvlaki! Given an extra special taste because of the delicious Ladolemono-dressing; a mix of olive oil, lemon juice, parsley, oregano and salt and pepper. 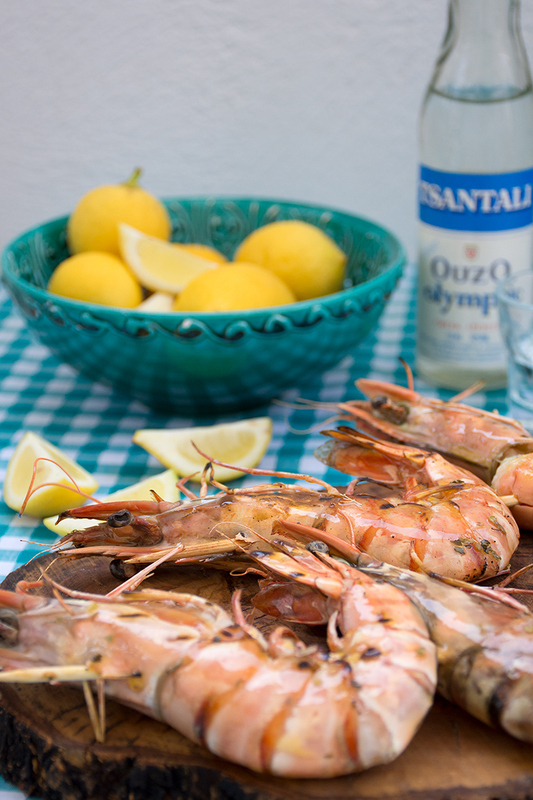 My personal advice: this typical seafood dish is best enjoyed with a nice glass of ouzo! After you have made the Ladolemono-dressing, place your souvlaki skewers in some water to soak, to make sure they will not go into flames on the barbecue. Pass the skewers through the prawns. Turn on the barbecue and when it’s hot, place the skewers on the grill. Brush them with the ladolemono-dressing. Turn them around and brush them again. Grill for approximately 1 minute on each side until the prawns turn pink. When ready, place the prawn souvlaki on a serving plate with the bowl of the Ladolemono-dressing. Enjoy this wonderful fish recipe! Make the Ladolemono-dressing: Mix the olive oil, juice of the lemons, parsley, oregano and the salt and the pepper in a bowl using a fork. 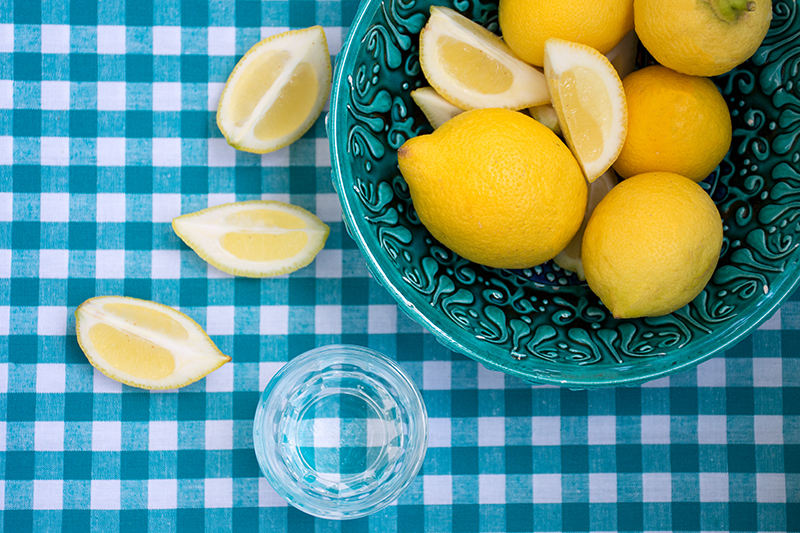 Place the souvlaki skewers in some water to soak, to make sure they will not go into flames on the barbecue. 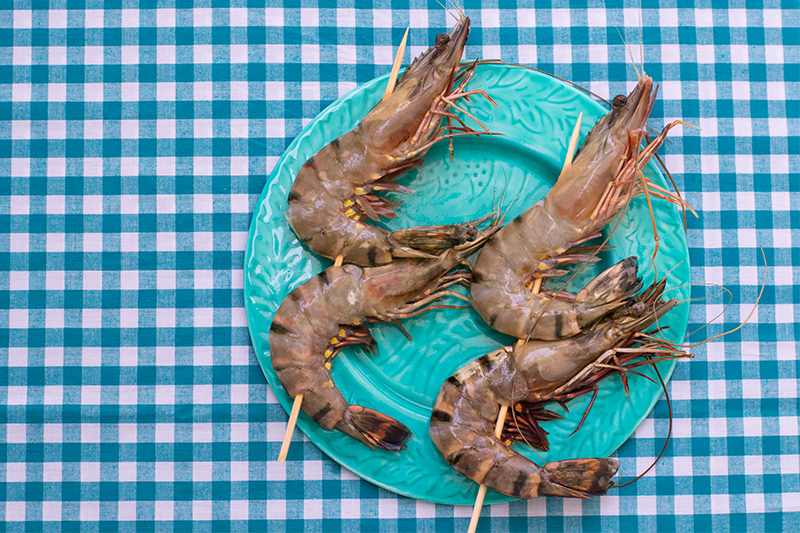 Pass the skewers through the prawns. Turn on the barbecue and when it’s hot, place the skewers on the grill. Brush them with the Ladolemono-dressing. Turn them around and brush them again. 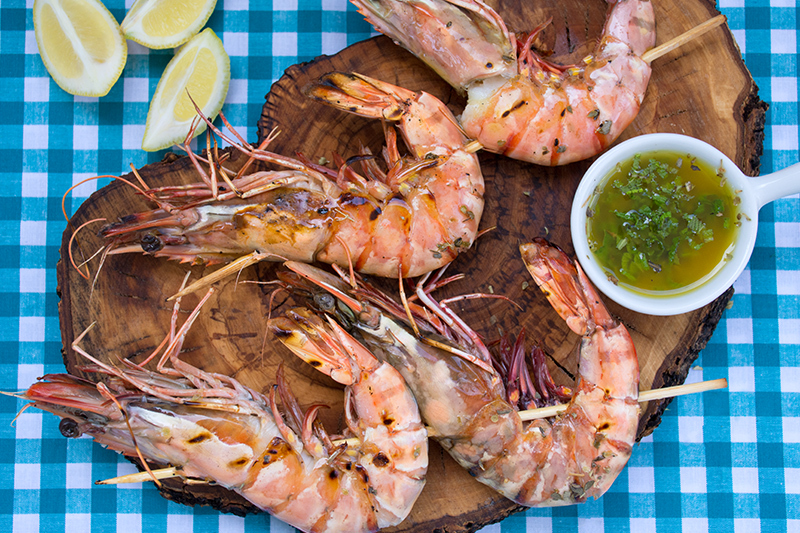 Grill for approximately 1 minute on each side until the prawns turn pink. Place the prawn souvlaki on a serving plate with the bowl of the Ladolemono-dressing.